Each year on World Thinking Day girls participate in activities, games, and projects with global themes to honor their sister Girl Guides and Girl Scouts in other countries. This year in Central Maryland, World Thinking Day will be celebrated on Sunday, February 20 at 1st Mariner Arena in downtown Baltimore. The event, which costs $16 per girl, will begin at 1 pm and will include a World Pin Ceremony, food tasting, music, dance, crafts and more. Girls can stay afterward to watch the Baltimore Blast game. The World Association of Girl Guides and Girl Scouts (WAGGGS) chose five countries to focus on this Thinking Day that represent the five WAGGGS regions: Bolivia, Cyprus, the Democratic Republic of Congo, Nepal, and Yemen. 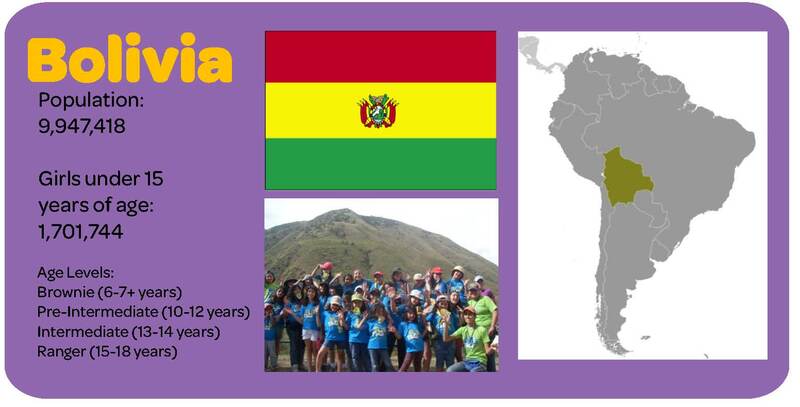 Learn more about the countries and download WAGGGS activity packs below. Register for World Thinking Day 2011 online here. Remember to bring your SWAPS! We hope to see you there! Download a World Thinking Day 2011 Bolivia Activity Pack. Download a World Thinking Day 2011 Cyprus Activity Pack. Download a World Thinking Day 2011 Democratic Republic of Congo Activity Pack. Download a World Thinking Day 2011 Nepal Activity Pack. Download a World Thinking Day 2011 Yemen Activity Pack. Information and photos courtesy of the World Association of Girl Guides and Girl Scouts and the CIA World Factbook.